Phineas and Ferb's 104 days of summer vacation take a perilous turn in the new video game Phineas and Ferb: Across the Second Dimension, available today on PS3, Nintendo Wii and DS systems. The game is based on the Disney Channel Original Movie of the same name premiering this Friday. 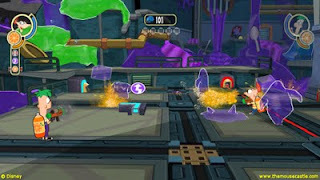 In the game, you take on the roles of the Danville duo along with the intrepid Agent P and a host of other characters to escape a weird parallel universe full of gelatin monsters, vicious robots and gnasty gnomes. On the way, you solve puzzles and blast your way through levels full of bouncy balloons, puffy clouds and speeding trains. Some of it won't make sense, but the boys will have your back, like when Phineas questions why there are crushing pile drivers in the middle of a series of conveyor belts. "Perhaps it was a poorly written episode," observes Ferb. Did I mention Phineas and Ferb: Across the Second Dimension has all the quirky humor of the TV series? The game play is fairly simple and won't be much of a challenge for experienced gamers. Still, the gadgets are fun, from guns that shoot baseballs to "carbonators" that squirt soda at the bad guys. Damage repair is plentiful and easily found, and on the rare occasions your opponents get the best of you, "deaths" rarely result in setting you back too far. If there's one complaint I have about the game, it's that the "Ticket Redemption" area that pops up between levels quickly becomes too repetitive. You're limited to an arcade-like "claw" game (think the three-eyed aliens in Toy Story) and a Skee-Ball type game to win prizes and tickets that earn you gadget upgrades. The object may have been to make power-ups simple for younger players, but I can't see how it'll hold their interests for long. The fun kicks in again, though, once you get past those mundane interruptions. Overall, Phineas and Ferb: Across the Second Dimension is clever and entertaining with plenty of imaginative and colorful levels that will especially appeal to fans of the TV show. 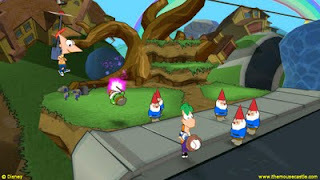 Phineas and Ferb: Across the Second Dimension is rated E-10+ for the console versions and E for Everyone for the DS version. This review refers to the Nintendo Wii version.